On the 28th of December 2016 two of our naughty Nursery girls, along with oldest female Oltaiyoni, made the journey to DSWT’s Ithumba Relocation Unit in the Northern Area of Tsavo East National Park. 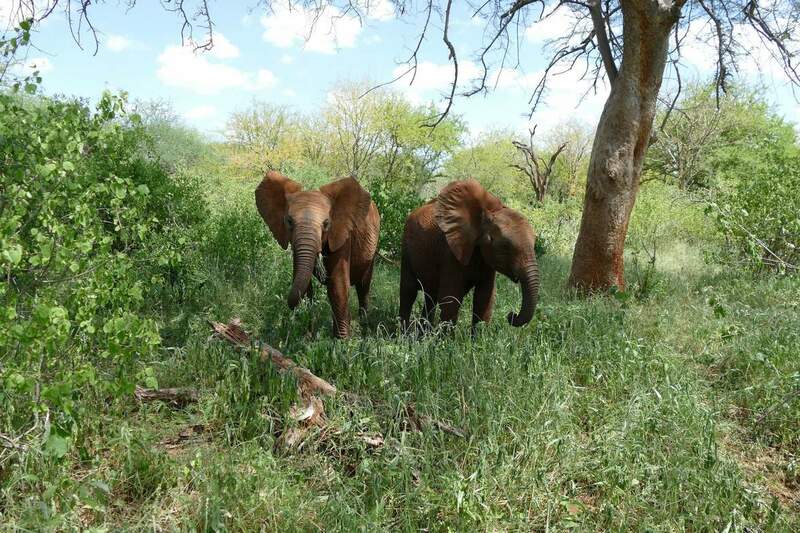 Rain having fallen, the area was now green, so the time was right to clear the Nursery of some of the older orphans. Whilst they will remain milk and Keeper dependent for a long time yet, probably another five years, before gaining sufficient confidence to begin venturing further afield with their Ex Orphan friends, the interaction with the older elephants and their wild friends coupled with the fact that Tsavo is perfect elephant habitat, made this a necessary transition, particularly as Roi and Kamok were beginning to outgrow the Nursery, throwing their weight around and becoming increasingly ill mannered, all pointing to the fact that they were in need of some discipline from older elephants. It was planned to make this move between Christmas and New Year in order to get them there in the green season. At 3.00am in the morning of the 28th, the three elephants earmarked for the move were injected with a mild tranquilizer to ensure the stress edge was taken off the whole experience. Once the drug had taken affect, their Keepers quietly enticed them out of the Stockades with milk bottles and led them into the Elephant Moving Truck. The truck with its three elephant sized compartments, and a passage way for their Keepers to walk and feed the elephants throughout the journey, is designed to ensure that the whole translocation experience is efficient and comfortable, with extra milk and greens available en route. First to be loaded was Kamok, followed by Roi, both happy to follow their milk bottles, with Oltaiyoni loaded last, who was a lot more sceptical about events and required a gentle shove at the end to get her safely loaded. The convoy was then on the way without delay and thankfully at that time of the morning, the roads out of Nairobi were relatively traffic free, so excellent time was made. Along the route, as is always the case, the convoy stopped so that the Keepers could cut fresh greens to feed the elephants. Once they reached the turn- off at Kibwezi, the road became a bumpy dirt road making the going much slower, but it was still early, just after 7 a.m. so it was still cool. Angela, Robert, Taru and Roan along with Daphne were all waiting at Ithumba for the arrival of the elephants, eager to see how they handled the transition from juniors to the more senior ranks. The lorry rumbled up to the offloading bay at Ithumba at approximately 10.30 am and by then the ambient temperature was rising, making it evident that the rest of the day would be a scorcher! We were concerned about how the Nairobi babies would cope with the higher temperatures, and as soon as they emerged, it was clear that the orphans had lost some body condition throughout the journey, their bellies more hollow than usual. They ventured out gingerly, and immediately took more milk, with Oltaiyoni and Kamok appearing the most unsettled in their new surroundings whilst Roi was seemingly taking everything in her stride. Soon they were joined by old friends from the Nursery, namely Olsekki, Enkikwe, Siangiki, Boromoko, Sokotei, and Sirimon along with Kithaka, Barsilinga and Lemoiyan, and then slowly, in batches of three at a time, all the Ithumba dependent orphans were called in to join them. Oltaiyoni found this somewhat overwhelming; lifting her trunk in the air and visibly unsettled while Kamok chose to stick close to the Nairobi Keepers who had accompanied them on the journey. As the newcomers absorbed their new surroundings, ears flapped incessantly evident that the warmer temperatures at Ithumba were being felt. All the newcomers were also splashing water between their legs and over their heads to cool themselves, although it was not long before they all began to feast on all the shrubs, bushes, and grass that abundant at this time of year after rain. The Tsavo vegetation was a novel surprise and the elephants were all clearly enjoying it! For the rest of the day they settled into their routine, Kamok shadowing the Keepers, Oltaiyoni timidly glancing around, and Roi behaving as though she had been there all her life! Meanwhile, they were surrounded by their friends who had made the transition earlier, and who no doubt were able to explain and comfort them, because they were soon settled. It was perhaps not surprising that Roi handled the move so easily, since she would remember time with her elephant family clearly, whereas Kamok was rescued the day she was born, and would never have seen elephants that size before, making the whole situation much more intimidating. Oltaiyoni, having been the Matriach of the Nairobi Nursery, suddenly had to adjust to being surrounded by much bigger elephants! The following day the Ex Orphans who are now leading perfectly normal wild lives, arrived at the midday mud bath to meet the newcomers. A magical scene unfolded as the dependent herd of 21 arrived for their milk feed first, after which they headed to the waterhole to cool off by tossing mud over themselves and submerging their bodies in the water. Then one by one, the Ex Orphans appeared through the undergrowth, led by Nasalot, followed by Wendi and her baby, Wiva along with many of the others, including Galana and her wild born baby Gawa, until there were over 40 elephants interacting with each other. All greeted the babies eagerly, gently caressing them with their trunks, no doubt communicating all the while, and meanwhile the Nairobi babies remained remarkably relaxed under the circumstances. When one can observe miles and miles of unspoiled wild Africa, devoid of human footprint, adorned by a profusion of wild flowers, plentiful green food for all wild inhabitants, and blessed with the greatest single elephant population remaining in Kenya, it is clear that our orphans have come to the best possible place to hone their genetic instincts and eventually lead a totally free and wild quality of life. Seeing the older Ex Orphans, who have already accomplished this transition, so happy and settled, fully integrated into the wild elephant population and with four of their own wild-born babies with more anticipated this year, one can take comfort and pride knowing that this next stage is an extremely exciting time for any lucky newcomers, who have been lovingly nurtured through their problematical years of early infancy in our Nairobi Elephant Nursery.